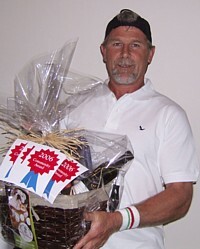 “I enjoy the freedom of having my own business and determining my own schedule and income. 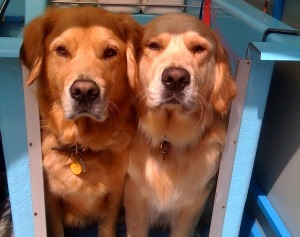 Knowing how beneficial our service is and how great the dogs look always makes me feel good. Meeting and talking with interesting clients and the opportunity to work outside in beautiful Colorado helps make it a perfect day”. Many years, thirty-four to be exact, were spent in classrooms molding the minds of adolescents as an instructor of Spanish and English. My love of animals since my childhood in Cuba led me on the path to the work with animal rescue for the past eighteen years as founder of the English Springer rescue of the Rockies Inc. (ESRR) team, in Denver Colorado. As if that weren’t enough, I left a teaching career prematurely to join The Pooch Mobile family eighteen months ago. During the annual pet expo 2007 in Denver Colorado the (ESRR) booth was located straight in front of the pooch mobile booth. For three days that cute trailer and I stared at one another, you might say that it was ‘love at first sight’, for all I did for the next week was think and dream of it! I broke the silent ‘love affair’ and I contacted the Franchisors Annie and Richard Ellmers, and behold, six months later, the ‘affair’ became ‘marriage’. My business is going strong! I enjoy meeting my human clients, as they come from every walk of life, and they love me for handling their pooch with respect. Most of all, I am grateful to work, daily, with my first love – pooches; they never cease to amaze me with their smart ways, and to teach me about love. No more human adolescent drama for this teacher – I’m plenty happy with the canine type…. 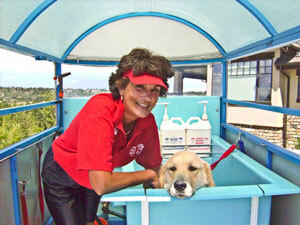 Being a Pooch Mobile Franchisee is wonderful. I absolutely love dogs, I enjoy working outside and it is fantastic being my own boss. It is so rewarding knowing that all the hard work I put in each day will pay dividends in the future. I had always thought about owning my own business but was afraid to take the plunge. Pooch Mobile was so affordable that the risk vs. reward factor made it a no-brainer. I wish I had done it ten years ago. Plus, being a franchisee, I wasn’t trying to make it entirely on my own. The support of a good established franchise organization like The Pooch Mobile can relieve a great deal of stress as you try and grow your business. Quite honestly however, how stressful can caring for the well-being of a bunch of dogs be? It’s too much fun. 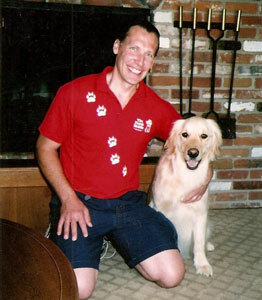 ~Robert Croley, The Pooch Mobile Multi Unit Franchisee, Colorado franchise inquiry form. My Wife and I had goals of finding a career that was challenging, fun and involved working with animals. When we discovered The Pooch Mobile we both instantly knew that this was exactly what we were looking for. We look forward to caring for your family pets!!!!!! I chose The Pooch Mobile. I also enjoy meeting the customers and working with dogs. All my customer’s love the service”. 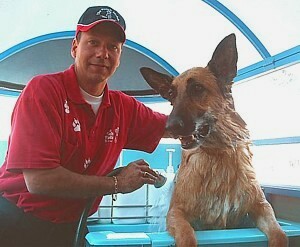 The Pooch Mobile has a superior bathing system and superior products compared to others in the industry. Not to mention the benefit of re-booking customers. The head office always helps me out with sales and marketing, and field support questions. If I have a question, I can rely on support from someone from the head office to help me out. Dogs Rule! I choose a Pooch Mobile franchise because it is a large well established company with a proven track record, very friendly team attitude and a strong support network. I am now financially better off, and I am able to dictate my own destiny with flexible hours, decide when I want holidays and have fun doing so. After operating a Sub-Franchise for 6 years I am now the proud owner of the Master Franchise on the Gold Coast, Australia. The main attributes towards my success are the excellent relationships that I have formed with the Franchisor, Support Staff and especially the previous Gold Coast Master Franchisee, Richard Ellmers who has now taken the system to the USA. Expanding Businesses due to demand for a professional convenient dog wash service. We would like to congratulate Robert Croley, Patrick Cronkhite and Lance Martin for successfully operating their second mobile unit with The Pooch Mobile. It was not all that long ago that these individuals found themselves in Corporate America, and a customer of The Pooch Mobile. 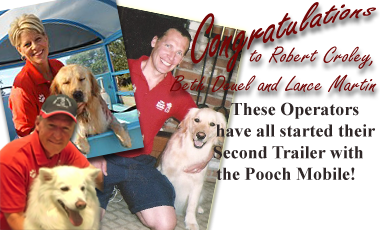 Robert, along with Patrick and Lance were all customers of The Pooch Mobile for some time before purchasing their own Franchise. It was only a short time after learning about the business model at The Pooch Mobile that these three decided to leave Corporate America and start their own Pooch Mobile Franchises. According to Robert, he has fallen in love with work all over again. You might see Robert from time to time in the Englewood/Littleton areas, as well as Beth in Castle Rock and Lance in Highlands Ranch/Centennial areas, especially now with two mobile units! We are very excited to have Robert, Patrick and Lance as part of The Pooch Mobile team. It is because of entrepreneurs like these that The Pooch Mobile can grow successfully and still keep our good standing in the community. With all of the glowing reviews that these three have received over the short time that they have been with us, we know it is just a matter of time before any one of them will add yet another mobile unit and area to their successful and growing business!